Jeff and Amy Burch (right), owners of the Howard Park estate in Western Australia, seem to have a boundless energy for talking about, collecting and drinking fine wines – as a wonderful evening of great Burgundies at their home in Margaret River proved. However, this report concentrates on a terrific event, held at Howard Park’s Margaret River winery, called the International Riesling Tasting. Now in its fourth year, the Burch’s and the winemaking team at Howard Park assemble around 100 Rieslings from the same vintage across the globe, which they taste and whittle down to a final selection of just 21 wines, representing the best of both Australian and global Riesling. Then over the Riesling weekend, a large group of consumers and trade descend on the winery for a morning in which all 21 wines are tasted blind and assessed, and a panel of speakers talk about the wines on show. 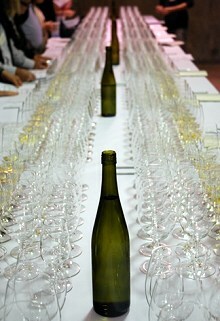 I was kindly invited to represent the German wines in this year’s line-up of 2007 vintage wines. The event concludes with a fine lunch in the winery. My detailed notes from the blind tasting follow, plus a chart showing how the wines were scored by the audience. Just a few points to note: the relatively lacklustre showing by some South Australian big Riesling names like Grosset and Orlando Steingarten is possibly a reflection on the vintage, which was a very difficult one in SA, or perhaps these very tight, young wines did not shine at this stage. Jim Barry’a Florita, the first wine of the tasting, was enjoyed significantly more by the trade than the consumers. This wine showed quite petrolly development, which obviously appeals to the trade, but not the public, who rated it their lowest scoring wine of the 21. The last wine of the line-up from Max Ferdinand Richter was the only wine of the 21 that was quite obviously off-dry to medium-sweet. For me it was a delightful wine, and the trade loved it too, awarding their second highest score to it. I suspect the Aussie consumers, to whom the message that Riesling should be dry has been driven home over the years, reacted against this, scoring the wine towards the middle/bottom of their range. 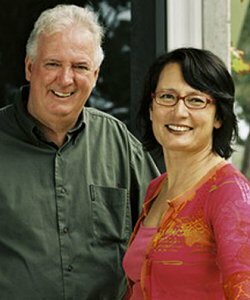 Finally, the wines of Great Southern in WA, including that of host Howard Park showed the obvious quality possible in this cool and beautiful region. Bold, golden yellow colour, a touch of kerosene and delicate floral notes. Big lemony attack of fruit on the palate, with lovely clarity and a full texture. 90/100. See all stockist on wine-searcher. Delicate, floral, talcum and light sherbetty aromas. Nose seems slightly repressed. Dry and delicate palate too, with a juicy lemon fruit and clean finish, but juicy. 89/100. See all stockist on wine-searcher. Bold yellow colour. Background of nettle, herbs and gentle waxiness. The palate has a hint of juicy orange sweetness and ripeness, before a dry, pithy acidity kicks in. Deliciously drinkable, if a little simple. 88/100. See all stockist on wine-searcher. More of a mineral sense to this, and gentle florality too. Good fruit – searing core of lemon zest fruit and acidity. Very dry, uncompromising, Austrian style. Pithy and sharp and beautifully focused. 90/100. See all stockist on wine-searcher. Yellow plum flesh and peachy quality on the nose, dry sense of minerality with a touch of something spicy and herbal, almost nutty. The palate delivers a big, bold fruit core, with masses of lemon confit, zesty character and the searing core of minerality powering through. 91/100. See all stockist on wine-searcher. Tropical fruit explosion! Masses of unctuous lychee and guava, almost mango like fruit. Behind is a core of minerality – almost salty, in a multi-layered aromatic profile. The palate has that density, but is much more linear and focused. The acidity builds in this, which is a rich wine, but a focused, sharp one too. 92/100. See all stockist on wine-searcher. Quite a reserved, dry, pithy fruit and subdued aromatics. This seems rather flat on the palate for me, with a razor-sharp, lemony acidity. 88/100. See all stockist on wine-searcher. Touch of minerality and gentle waxiness. Lemon rind and a touch of something herbal. Lovely palate – big texture, and lots of weighty, confit lemon fruit, solid core of fruit that is expansive yet razor sharp. 91/100. See all stockist on wine-searcher. Rich nose suggesting sweetness, with some grapy and nectarine notes, and perhaps a touch of botrytis. Palate falls a little flat, the acidity and lemony fruit at the core is good, though it seems quite dry and shows just a hint of toffee in the finish. 87/100. See all stockist on wine-searcher. Fantastically oily, viscose nose with peach kernel and ripe, fleshy stone fruits. Minerality comes through decisively on the palate, a big rush of something herbal and steely, with the weight and the flesh coming through equally powerfully. Long and explosive stuff and indestructible I’d have thought. 94/100. See all stockist on wine-searcher. Fairly light, gently peachy nose, very Mosel Riesling kabinett in style. Peachy and elegant fruit on the palate too, with a seamless, gentle core of acidity. Delicious. 88/100. See all stockist on wine-searcher. All about minerality, with nutty, slightly smoky and slaty aromas, that whiff of cordite. On the palate there’s that zing and zest of pure lemon juice, but there’s something here that hints at richness and fleshiness, with almost a creamy texture and weight. Complex and intriguing. 92/100. See all stockist on wine-searcher. A deal of smoky minerality here too, more toasty, kerosene notes, with a touch of fleshy, ripe fruit. The palate has that lemon and lime freshness. 89/100. See all stockist on wine-searcher. There’s an earthiness and nutty character to this, with some minerality and citrus and Cox’s Pippin apple fruit. Quite complex. I like the minerality here, and that crab apple, dry tang. Fascinating stuff and delicious in the end. 91/100. See all stockist on wine-searcher. Bit of herby, nutty, botrytis on this, with a nicely mineral background. The palate has a big, ripe, lemon and lime core, with lots of raciness but a fairly simple finish, though showing good, bracing acidity. 87/100. See all stockist on wine-searcher. Delicately floral lime leaf and grassy, nettly nose. Racy and fine on the palate, with lots of crisp, mouth-watering lemon and a dry apple acidity in the finish. Powerful but delicate. 90/100. See all stockist on wine-searcher. Fragrant, delicate nose, with delightfully teasing hints of a more exotic, ripe and peach down fruit, but all staying constrained and delicate. The palate is lovely – shimmering acidity, and that wonderful tension between the gossamer-like fruit and pithy acidity. 92/100. See all stockist on wine-searcher. Fine, steely, very precise nose, with some minerality and just a lovely burgeoning sense of something more peachy and ripe in the backg round. Fantastic acidity too, that powerful minerality giving this lovely tension and drama in the mouth. 91/100. See all stockist on wine-searcher. There’s a sense of richness and intensity here, a touch of butter, but the palate becomes much more linear and focused, with a big core of acidity. One for the future. 92/100. See all stockist on wine-searcher. Floral and leafy, even a touch of geranium or leafiness. Like the dry apple core and lemon pith acidity and a definite sense of shimmering minerality in the finish. Fine. 90/100. See all stockist on wine-searcher. Intense minerality, a touch of apple skins and something slaty. The palate has a real sweetness – the first genuinely off-dry wine of the tasting, with beautifully grapy and peachy fruit, and fine length. The knife-edge balance is there. 91/100. See all stockist on wine-searcher. The audience was asked to score each wine, and the average scores for both consumers and trade members attending the tasting are given below. This was a fantastic event, so thanks to Jeff and Amy Burch for inviting me to it. Anyone interested in attending in future years should keep an eye on the Howard Park web site.